Further, current procedures are inefficient.Since document content is inextricably enmeshed with its format, each change to either the content or the format requires either that a whole new copy of the document be created, or that the original be overwritten.This becomes a serious problem for documents which are revised often, especially if the older revisions need to be kept. Yet further, there is a difficulty of resolving the markup codes from the structure.Markup codes have to be differentiated from the content stream they are a part of.This involves designating `special` characters or sequences of characters which should be identified and acted upon.This complicates the task of any routine which must work on the document.Any program or procedure which needs to format or understand the document must know all of the special codes and be able to correctly separate them from the content.All routines which work with the document must have exactly the same model of how the embedded codes are formatted or placed.If any operation misinterprets the code sequence even slightly, or mistakes content for formatting, the document or a part thereof will be reduced to meaninglessness. Still yet further, existing practice has a processing speed disadvantage.To act upon a document combining structure and content requires that the stream be processed serially.Each token in the stream must be parsed to determine if it is a special formatting character or is part of the content. It can therefore be seen that the practice of manipulating the architecture and content of a document of the prior art suffers from significant disadvantages. 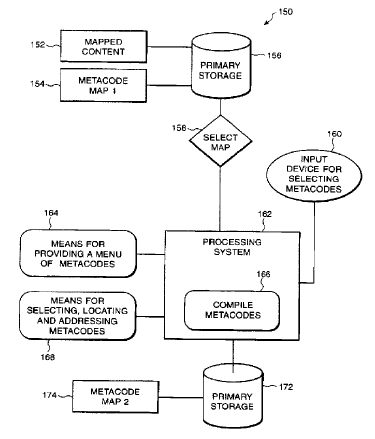 The present invention provides the ability to work solely on metacodes.The process allows changes to be made to the structure of a document without requiring the content.A metacode map could be edited directly without the mapped content.Additionally a new map can be created based solely on an existing map without requiring the content.This allows changes to be made to the appearance or structure of a document by individuals who may not be allowed to modify the content.Document security can be significantly enhanced since the metacodes and content of the document are separately stored and protected. The present invention further provides the ability to work solely on content.Conversely changes to the content can be made without the overhead of a completely encoded document.This can be important because complicated coding conventions often get in the way of the content.For example, a copy writer has no interest in the intended layout of his copy until it is complete and correct.The invention allows new maps to be created using just content without reference to existing maps. The present invention also provides for storage efficiency of multiple versions.The invention allows much more efficient storage of multiple copies of differently encoded documents.If the content is invariant and only the metacodes change it is inefficient to store multiple copies of the content.According to the prior art in the field this would be required if both versions are to be kept.Using the invention only a new metacode map has to be stored. For information on the Patent Infringement Verdict, please click to read the Press Release. ミシェルVulpe 、 '449特許の発明i4iの創設者で、言う： "われわれは、最終審判の条件に満足している。金融i4i賞のためにする290000000ドル以上の恒久的差し止め命令は、 Microsoftに対して発行されている。 "ミスターVulpe 、 "我々はこの結果には報われた気が追加されます。特にi4iは、 ISO 29500 OOXMLの標準を実装することが重要ですカスタムXMLのユーザーをサポートするためには、最大限の努力を尽くします。 "
ラウドンオーウェン会長マクリーンワトソンキャピタル社とi4i 、言う： "されてi4i社の会長を13年後、私は、両方の建物の中に、同社の成功の判断を達成していると、臨時のハードワークに感謝いたします。終局差し止め命令をi4iための重要な決定とすべての特許所有者の権利のためです。 "オーウェン氏は、 "我々のパートナー、当社の投資家と我々の法律顧問McKoolスミス、タイラー、テキサス州には感謝しているパーカー、バント＆ベースを追加エーンズワース、彼らの忠誠心を、この重要なコミットメントを達成するために。 "
マイケルCannata 、 i4i LPとは、知的財産基金Northwater顧問の責任者によると： "この判断をどのように専門のファンド会社には重要な特許発明では、公平性を支援する資本との特許訴訟管理の専門知識をもたらすことを示すときは、非常に大きな会社に対しての権利を強制する。 "
means for resolving the content and the metacode map into the document.